Today’s guest blogger, Mike Anderson is the owner of Wolfegang’s Collectibles, who makes a living buying, selling, and conserving antique sewing machines. He and his son also collect vintage snowmobiles. 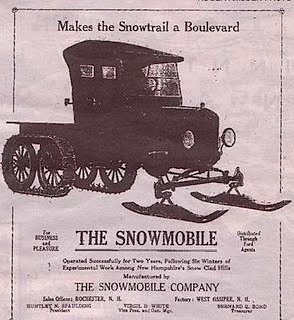 While many sources state the first snowmobile was made by Joseph Armond Bombardier or Edgar Hetten of Arctic Cat, that is not the case. It was actually a converted Ford Model T, made by Virgil D. White of Ossipee, New Hampshire. The Ford Model T Snowmobile patent was issued to Mr. White in 1917, but pictures of his earlier creations date back to 1910. The front tires were removed, a set of wooden skis were added, and a set of heavy track-like chains connected the dual axels. The Ford Model T Snowmobile changed life in the north country of New Hampshire. Back then, roads were not paved—and not passable during the severe New Hampshire winters. A machine like this now made it possible to deliver mail, get into town, and travel! However, few could afford the luxury. Still, this makes my son and I very proud, as we are New Hampshire residents who collect vintage and antique snowmobiles. I give full credit to my fellow Granite-stater. But it is important to note that all of the manufacturers who followed contributed to the design of the powerful and reliable machines we know today. Snowmobiles, sometimes refered to as “snow machines,” were originally created exclusively for utilitarian purposes. Work! Companies like Polaris and Arctic Cat championed the cause during the late 1950s into the 1960s, making mainly machines for line crews, state police, and conservation officers. These machines were known as rear-engine drive machines, where the operator sat in a cab, which attached to a track and motor chassis. 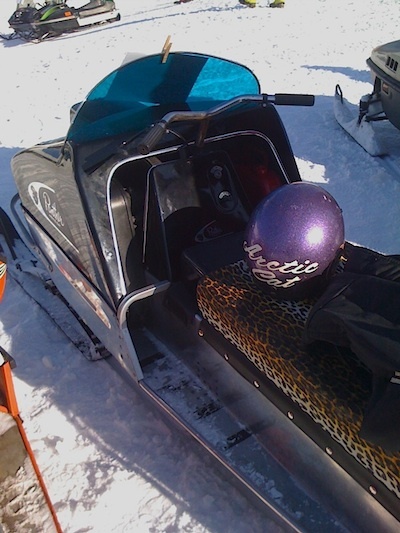 Today these two-piece vehicles are among the rarest of all old snowmobiles. 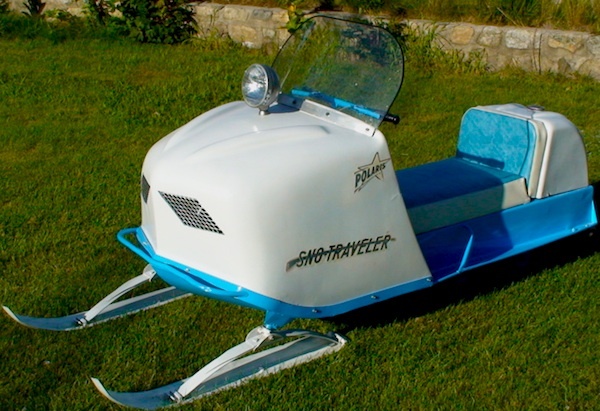 My son and I are fortunate enough to own two now—a 1962 Polaris Sno-Traveler and a 1964 Arctic Cat model 170D. The ’64 Cat is an especially rare machine, with only 58 produced. As with almost any motorized vehicle, it was soon realized that these machines could be produced for leisure, too. A new way to beat the winter blues, a family friendly activity! Not long after the introduction of the snowmobile made for sheer fun, the work snowmobiles of the past slowly disappeared, with most being discontinued by the 1980s. Snowmobiling as sport started in the early 1960s, and by the mid-1970s, a few hundred companies were making these machines. Names like Whip-It, Snow Flake, Sno Pony, and Fox Trac represented the smaller startup companies, while the giants of the day—Polaris, Moto Ski, Sno Jet, Arctic Cat, and Ski Doo—offered several models each year. Brands such as Rupp, John Deere, Scorpion, and Yamaha succeeded in the snowmobile market for years, and today, their machines enjoy a strong cult following. Today, only four snowmobile companies exist, Polaris, Arctic Cat, Yamaha, and, yes, Ski Doo! My son and I have only been collecting these old machines for a few years now. Like antique motorcycles and classic Ford and Chevrolet cars, old snowmobiles are hot collectibles. Over the past few years especially, the “sport” of collecting these beautiful creations has exploded. Once simply a gathering of a few groups of guys scattered across the United States, vintage snowmobile swap meets, clubs, and vintage rides now number in the hundreds each year world-wide. Also, there are several snowmobile museums across the U.S. You can learn more about antique and vintage snowmobiles at David’s Vintage Snowmobile Web Site and The New Hampshire Snowmobile Museum Association web site. 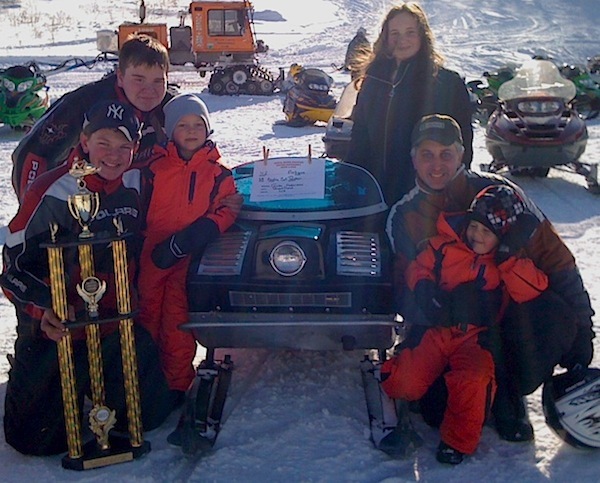 Anderson (right) with the 1968 Arctic Cat his son (holding trophy) restored. The machine received the 2011 People’s Choice Award at the Moose Mountain Recreation Area in Brookfield, N.H. In our personal collection, most of our snowmobiles will need restoration, but this is not uncommon for a vehicle that drives only in the snow. 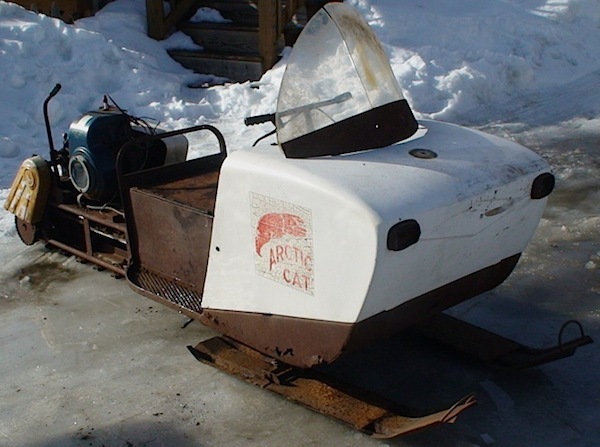 If you love vintage and antique vehicles, snowmobiles are fascinating, as so many companies made them. You may even find yourself restoring a few—or 50, in our case! I have a 1970 Luvbug are they rare? I was wondering if you have ever heard of a moto Jet? My boyfriends son bought on and we have no information on it!!!!!! This 1959 Goggomobil Is Insanely Cute and Gets 55 MPG. Why Can’t Detroit Do That? “ ” Ruth’s powerful, left-sided swing regularly sent balls sailing over the right-field fence.